For some people, being kind comes naturally. But, the rest of us could use an occasional reminder of the value of being kind to others, as well how good it feels when we do something nice for someone, without expecting anything in return. Step 2. 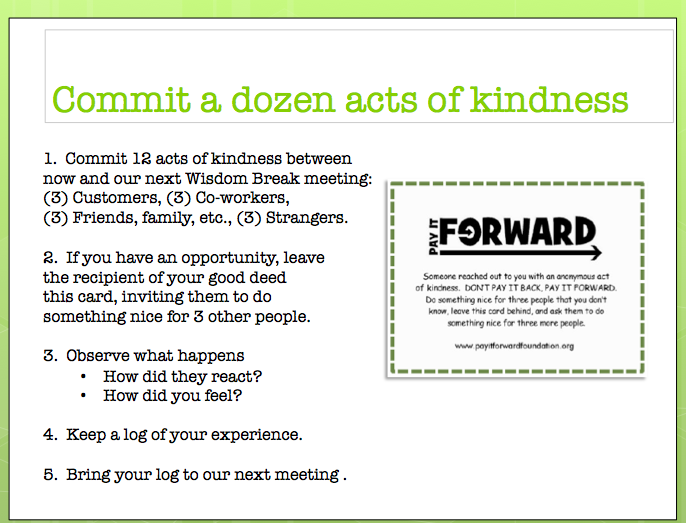 Print and distribute the log for your agents to record their Dozen Acts of Kindness. Step 3. Print and distribute 12 copies of the Pay It Forward card to each agent to give to the recipients of their 12 acts of kindness. At your follow up meeting, ask agents to share how they felt about their experience. Besides talking about the impact their acts of kindness had on their 12 recipients, ask team members to describe what the experience was like for them — personally. 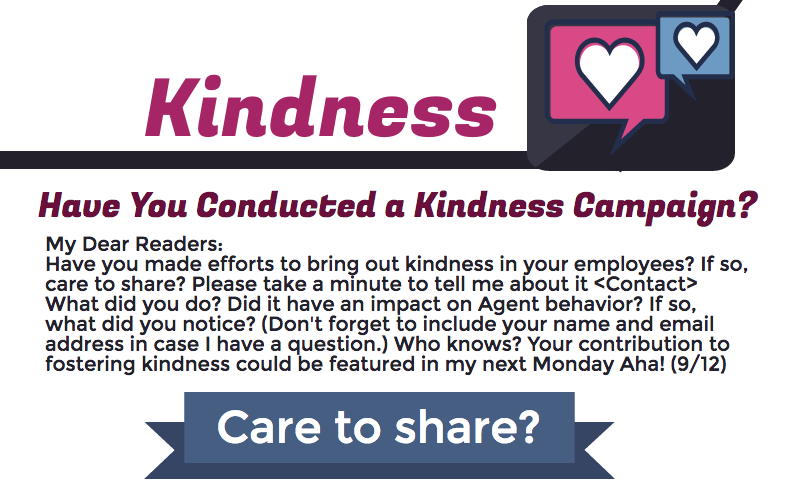 When I facilitated this campaign, I asked supervisors to share any changes in agent behavior they observed during or after their Dozen Acts of Kindness Campaign. I’ll write about what these leaders shared with me in my next Monday Aha! on 9/12/16. [How about you? Did you do something similar at your workplace? If so, what impact did it have? Care to share? I’d love to hear from you!